The colour pairing poll went up earlier this week, and after the requisite four days we’re back with the results! The race was tightly-fought to the very end, but when the final buzzer sounded there could be only one winner. 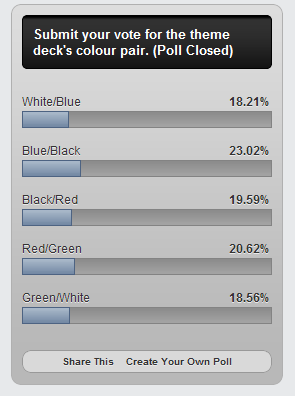 Here are the results of the poll, with Blue/Black narrowly beating out a late surge from Red/Green. The M13 set has a well-developed piratical subtheme, which could be expanded and explored here. Where the islands meet there marshes, there be pirates! The Goblin Artisans set adopted bond as a basic-level mechanic, and there’s plenty of room to maneuver here. Bond is a special ability that many creatures get when another basic land type is in play (think of the classic Kird Ape as an example). This encourages multicolour play and has a lot of synergies. Harness the power of the land itself! Black and Blue decks often take to the air as their creature-based path to victory. Command the forces of the skies as you soar above your opponent’s defenses for victory! Another of the innovations in “M13” is forget, a keyword which finally replaces the more colloquial “milling.” With cards that move your opponent’s library directly into your graveyard, it will be an experience your opponent won’t want to remember! The Brain-Eating Zombies are a card which gets stronger every time your opponent discards a card, and if the deck has its way that will be early and often. When you hit your opponent’s hand as well as their life total, nothing is safe from the ravenous undead! In light of that, which theme would you like the deck to embrace? Remember, to be eligible for the giveaway entry for Part 2 you’ll want to be sure to leave a comment below. Let us know what theme has tickled your fancy, and why! I had to go with the Pirate theme. We can do most of the other choices in Magic Proper, it’s a Pirate deck for me. Got to go pirates as well. As much as I love playing U/B control and mill, seeing a thematic tribal deck that hasn’t been explored before is too tempting. Pirates! I agree with the above comment that many of the themes already exist in some form. Pirates sounds interesting. I’m going to have to say pirates, everything else is too generic and doesn’t add any spice to the flavor. Although I’m against pirates as I’m more of a ninja myself. Actually I’m quite fond of U/B being tied to milling. With so many cards already suited to the theme (see Glimpse the Unthinkable and Mind Funeral), flavor-wise it makes perfect sense. With blue’s affinity with the mind and black’s penchant for eroding everything it touches, “forget” is the perfect theme mechanic for a U/B deck. Could even run a few copies of Rise from the Grave. 1/ it’s the perfect way to put back into light those not so very played Landwalk and Landhome abilities : remember Pirate Ship? Bog Glider? The Nightstalkers? Pirates would have a host of those abilities representing both their abilities to roam the seas (Islandwalk/Home) and to bring secretely those stolen goods to the shores through some hidden pathways (Swampwalk). 2/ If we go along those lines, the strategy would be to create lands of a chosen type under the opponent control to attack unblocked (arrrr their village seems to be undefended on this side, lads!!). There could be also an hint of control in it, either through draw (arrr look into the scrying glass, young man! ), graveyard manipulation (arrrr pillaging some forgotten tombs for treasure is fun!) and even simply stealing (arrrr gimme those shiny things, you won’t need them after you’ve jumped the plank!). Even the Forget mechanism could find a place in it, since that good old Reef Pirates from Homelands is actually a Pirate creature that mill the opponent. 3/ thematically, its just DAMN FUN!! there has always been Pirates in MtG, but not until the April’s Fool deck of Pirates vs Ninjas was there a REAL idea of creating a Pirate deck. Ninjas have been done in BoK and Planechase, now’s the time to roam the seas of the Multiverse and pillage the shores of the Planes! All aboard the Skeleton Ship, I say!! Land ho!! I wasn’t very sure about Pirates! theme, so i went with milling (An interesting and effective milling deck is a challenge after the merfok deck from Lorwyn), but i will be happy too if pirates gets selected! I voted for pirates as well. The theme sounds most flavourful of the options and would make for a fun deck. I suppose pirates are also rather generic, but from what I’ve seen, it’s the less explored trope in magic. The deck, at its finest, would feel like your own pirate crew that you captain around! Pirates! Resonant and fun, even for new players with little knowledge of past magic expansions. Pirates. All. The. Way! What could be cooler than mustering a pirate crew and ships and bombarding your enemies?! Nothing. I voted for Forget Everything. Although a Pirates theme would be awesome, the ability to put your opponent’s library into your own graveyard could lead to a very interesting reanimator type deck–weakening your opponent and using his creatures against him! It could tie in with a brain-eating zombie subtheme too. Pirates are a very catching theme, and blue-black offers a good quantity of creatures and removal. Pirates is my choice! Definitely pirates, since I was thinking about voting U/B earlier if there were more Pirate tribal cards. Looking forward to putting together some Explorer of the High Seas with either bonds or the Tidal Serpent. Also, Scourge of the Seas! I voted Forget Everything. I have a soft spot for mill decks, so I’d love to see another version here! As much as I would really love to see Goblin Artisans tackle Mill, as it’s one of my favourite strategies and I think it’s a great pity that it still hasn’t really found its place, I went with Brain Eaters. I’m a big tribal fan and I think that’s something that also draws in a lot of new players. Brain Eaters is flavourful and sounds like it could work really well mechanically, a great example of top down design. Y’know…I think I’m going to hit gatherer tonight and see if I can make my own Brain Eaters in Modern! Yeah I have to go with the pirate theme, since that is one of the major flavor themes of the set. I’m tossing in my hat with Pirates! Mill is an uninteractive strategy that is not very competitive anyway, and I personally find it boring – hardly something I’d want to start a brand-new player on. The advantage of Pirates!, in addition to being a cool and flavorful concept, is that it’s a primarily creature-based theme. This fits the expected play pattern of most games while still letting us introduce blue and black control elements. I voted for Pirates as well. I’ve always found Mill decks to be an interesting but lackluster concept and probably not the best way to introduce a new player to the game. The Pirate theme sounds a bit more straightforward and fun in comparison. I voted for Pirates! I love tribal decks and I feel like the other options weren’t as exciting. Forget and bond seem interesting, but I don’t like milling decks and I am not really a multicolor player (I usually only do 2 colors and splash one more at most). Dark skies doesn’t sound interesting – it is just a bunch of flying creatures. And I have a zombie deck, so I would not be interested in that theme. I think Bond with the Land would do better in a three or more color deck simply due to more variations on land types, and Dark Skies seems like just a variant on the standard UW Skies that we seem to get so often. So with those down, the other three were harder to narrow down. Based on the description Brain Eaters would be centered around the keynote card, and while hand disruption isn’t a bad thing to center an intro pack around, it doesn’t seem as interesting as the other two. And while Pirates: The Deck is a great idea (naturally pirates would be the colours of the ocean and greed), I couldn’t pass up my favorite archetype in all Magic. So my vote went to Forget Everything. 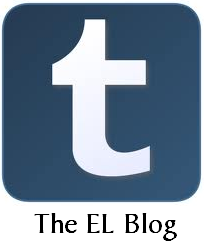 by the way… I forgot to log in when I made that previous post. Does it matter when it comes to the contest? No worries, mate, it still shows as you! Yes, I can see email when folks post comments, so you needn’t worry! Pirates would be something new and interesting to flesh out. I really wish you gave us the option to pick 2 themes at once. Many of precons and intro decks skirt around between 2 themes from a set/block that fit into the deck’s color(s). My choice would have been Pirates & Land Bonding. (yo ho ho, it be a pirate’s life for me, bonding with the sea) However, given only one vote, I picked Bond with the Land, with the hopes that’ll we’d see pirates in there as a matter of coincidence. Fliers are overdone in multiple colors and milling is still milling, even if it has a different name. (and don’t get me started about how sick I am of zombies in everything pop culture recently). Bonding with lands sounds like a neat design space to explore! Pirates would provide a false pretense to new players as well. Are we gonna see a hipster subtype? And when did magic become a joke? I think that mill is the way to go. I mean, jedi-mindtricking someone into forgetting everything is always entertaining, and mill is a fun archetype to play. Counting down the cards in someone’s library adds excitement to the game, it all comes down to the luck of the draw, a feeling creature based decks can’t replicate. Most importantly, there are cards in other sets to support mill. Those starting with pirates would be in for a nasty suprise if they actually tried to improve the deck, which is the point of intro packs in the first place! This disconnect between the rest of magic and the pirates intro pack would leave new players in the dust, and possibly give the players the misconception that they might be playing a new game entirely, one, in my opinion, not as cool as magic. Overall, pirates aren’t the most well thought out idea, and I beg voters to choose something else. I think intro decks are exactly what they say they are – they introduce a new theme or tribes to the mix. If they just repeated the same mechanics, they wouldn’t be as interesting. And I feel that each new theme would have a bunch of cards to back them up… Look at decks that have come out recently: Myrs, golems, infect, and soulbond. Each new theme has plenty of options from the past sets to support them. I feel as if it would be the same thing as with pirates and most of the other types listed here. Also, I don’t think Pirates is a joke. There are plenty of tribals out there: zombies, samurai, ninja, golems, elves, etc. I feel like adding another tribal is neither a joke, nor is it a move in the wrong direction. Not all intro packs showcase a new mechanic or tribal. In fact, in every set, there is at least one intro pack that showcases an older mechanic or deck build. So why not mill? Also, while we’re at it, Pirates misrepresent Magic. Samurai, elves, and golems are taken seriously, the way that Magic is meant to be taken. But Pirates? Whenever Pirates are mentioned, someone automatically strikes up a conversation about the newest Pirates off the Caribbean movie by Disney. Pirates aren’t taken seriously. In the public eye, pirates are lovable scallawags; drunkards who couldn’t hurt a fly and might break out into song at any moment. They are very goofy, and worse, connected to Disney. Now take a game which is supposed to be about to ultra-powerful wizards who travel through dimensions. They are in a struggle for their lives, summoning the most powerful spells in their arsenal to kill the other. Now imagine, in this environment, one wizard summons a pirate. The pirate sways around drunkenly, and the other wizard laughs as he summons a giant beastie, who stomps the pirate AND the other wizard. Pirates just don’t fit. They are a conceptual error. When someone sees an Intro Pack supposedly representing magic with pirates on it, they will not get a feel that this represents a deathmatch between wizards, or even a good game. They will get the urge to laugh. Magic is a game about a deadly battle, and pirates just don’t show people that. I believe that you are referring to the pop culture pirate. If you look at pirates historically, they are a fearsome group. And I feel like they fit in because they ARE desperate, greedy, and struggling for their lives. There are many historically respected pirates (Blackbeard, Captain Kidd, to name a few)! And I understand that there are plenty of intro decks that make no additions, and I even said that! But I think that the major point of an intro deck is to introduce new players to a new game. At the same time, it is also responsible for introducing current players of the game to new cards and themes to the game. I don’t think that introducing Pirates as a new tribal is a bad thing. To be honest, I think it depends on your take on things. When somebody says pirates, my mind jumps to Blackbeard. If your mind jumps to Jack Sparrow or Disney pirates, there’s not much I can do to change that. I feel like everything is connected to Disney or pop culture in some way: Little Mermaid = Merfolk, Ninja = Kung Fu Panda, Samurai = Mulan, Dragons=How to Train Your Dragon, Golems = Iron Giant, etc etc. To each his own, I guess. The same goes for me. If we leave apart the Jack Sparrow archetype (and you’ll forgive me if I prefer Eroll Flynn or Pirates Of The Blood River to that sfx-infused garbage from Disney, imo), there have been pirates referenced in cards in M:tG since Alpha (trust me : I was there when Revised hit the stores) : hey, Pirate Ship anyone? There was even a time in the prehistoric days of the game where there was serious thinking about players creating a pirate deck : hence Ramirez Di Pietro, Ghost Ship, Reef Pirates and so on. As Hirshey said, the point of an intro pack is to introduce new players to a game. If, due to the mainstream success of pirates stories through Disney, pirates are the new trend, why not think that it could be a good appealing theme for a new audience? Should they have dropped the whole Kamigawa thing just for ‘Kung-Fu Panda’? Or the werewolves because of ‘Beauty And The Beast’? Etc, etc…If you really want a recent take on what pirates were, just read Tim Powers’ ‘On Stranger Tides’ (yeah, I know : it was castrated a lot to make the last PotC movie…still an awesome book). Why did you guys choose Black-Blue? I chose it because it had the possibility of being unique; not just teaching the new player how to play and construct a deck, but also showing the depth of magic and the strategies that could be used. If I was concerned about the player learning how to play, I would have chosen Red-Green. I’m more concerned of the experience they might have during their first game, because they will most likely never play again if they don’t enjoy their first experience. Now you probably know what’s coming next, but what’s unique about pirates? To me, they are like Red-Green, except they have an eyepatch. They are not unique at all. The concept is generally the same: bash in with creatures, maybe with some tricks to let them through. Mill, however, gives a different experience. It goes beyond the normal, and shows the player the many different ways the game can be played. Also, no matter what you guys might think, the majority do not think of pirates as dangerous. Not all the fault lies with Disney. The pirates’ habits made them seem more goofy. Most real-life pirates got drunk all the time because there was no clean water, only grog. Now I don’t know about you, but I have no respect for someone who is drunk all the time, and neither does the rest of America. Add Disney antics to the equation and they seem even goofier. This is why pirates are not taken seriously, while ninjas and samurai are, even though they’ve had Disney movies made about them. In history, they had something to be respected for. I’m afraid the average Americans’ disrespect for pirates will translate to the game of magic when they buy the intro pack. If so, even if they like the game they might get the wrong idea about the concept behind it, and take the game wrong way. With mill- well, making someone forget everything is definitely NOT goofy, and it is a relevant and fun gameplay style, as I said earlier. It makes sense, although it wouldn’t to a pirate. In mental images, mill is unmatched. You are making someone forget all their experiences, removing everything from their minds until they have nothing left. This could make newer players feel in the place of an evil mastermind, sort of like Archenemy. It gives a diabolical feel to the game, and what’s more fun than being evil? In fact, it’s like being Nicol Bolas! You can go to the movies to see pirate ships firing at each other. It’s commonplace. But intruding into someones mind and removing their memories is spectacular. Also mill is actually less difficult to learn than regular magic. You do what the card says. Big whoop. It’s more exciting as well, relying on the draw more than other decks, other than miracle. Plus, the flavor text on mill cards is awesome. How is this even a choice? Of course pirates. Not close. As an addition to my previous post : having Pirates as the main theme doesn’t mean there won’t be a sub-theme taken from the same poll. For example, Homelands’ Reef Pirates are both pirates (well…Zombie Rogue, using the Creature update) and a mill card. Technically speaking, I think Pirates would be a more Black/Red sort of folk… But heck, black and blue are my favorite colors and it just so happens that I was hoping for more pirates in Magic. No question, Pirates I choose you! Brain Eating Zombies was my favorite, but I see the Pirates have it by a pegleg or two. Happy to see that Pirates won out. That was my first choice. I’m all for subthemes getting a chance to shine, and Pirates could do for M13 what Universal monster tropes did for Innistrad block; that is make the game more accessible for the masses, and increasing Magic’s creative real-estate beyond Tolkien and Lovecraft character classes. However, I would have picked the milling theme … just because having an alternate way of winning the game is fun. I’d love to see Bond in action.